For Ellipsis Monday Photo Shoot #104: Photographer's Choice, I thought I might take the opportunity to shoot fresh portraits, or at least new photos, of Cayenne and Pepper. The trouble is, there's a reason why I seldom get photos that are good enough to successfully convey their unimaginable cuteness. The house is not brightly lit, which in the Arizona heat is a good thing, but not so good for photographing a moving object. If I'm doing anything around Cayenne, and it doesn't involve petting her, she's definitely on the move, pressing her head under my hand, rolling on her back, and performing other "Look at me! Pet me! Play with me!" antics. So photos of her tend to be blurry. 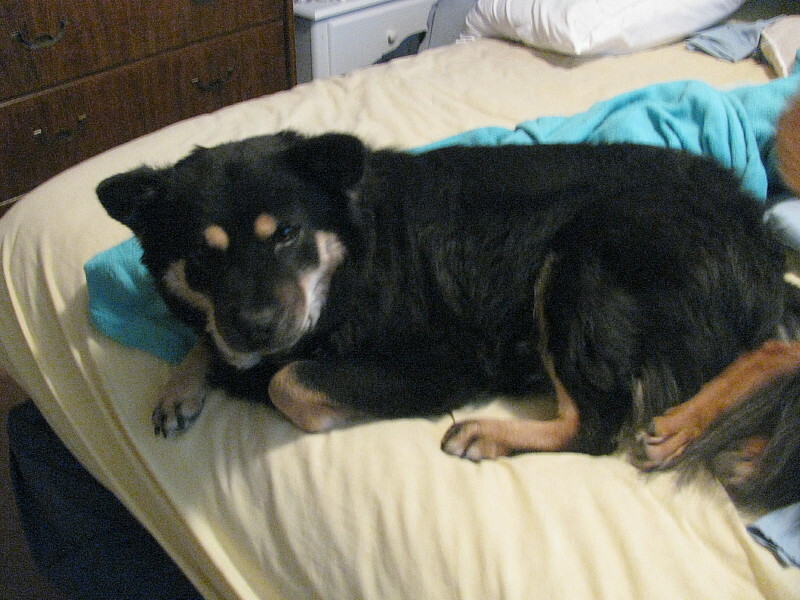 If I use flash, the light turns her brown eyes yellow - and chances are, the photo is still blurry. Pepper is generally more laid back about getting attention. In fact, the first year we owned her, she just wanted to be left alone. 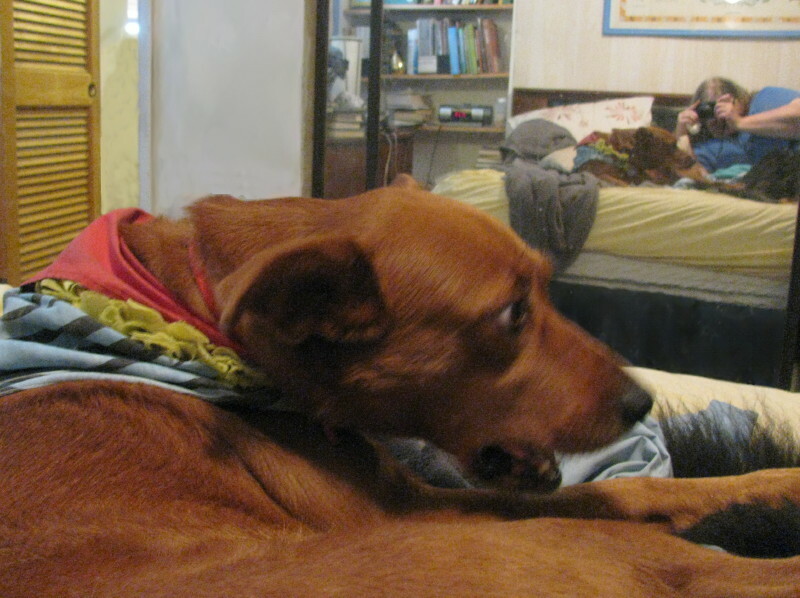 But when Cayenne is rolling around on the bed or the couch, that disturbs Pepper. And in any case, she knows and dislikes the camera. As soon as I point it toward her, Pepper usually gets up and leaves. 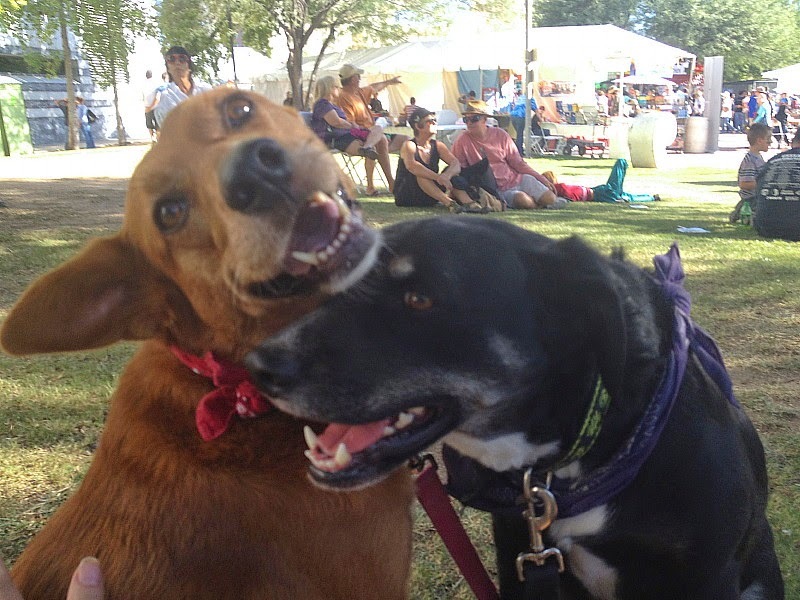 Dogs aren't the only animals that tend not to hold still for a portrait, of course. Two years ago, I spent many lunch breaks at my temp job in Oro Valley, trying to photograph butterflies. I doubt that I ever got a single portrait of those restless creatures. But this morning I got lucky. 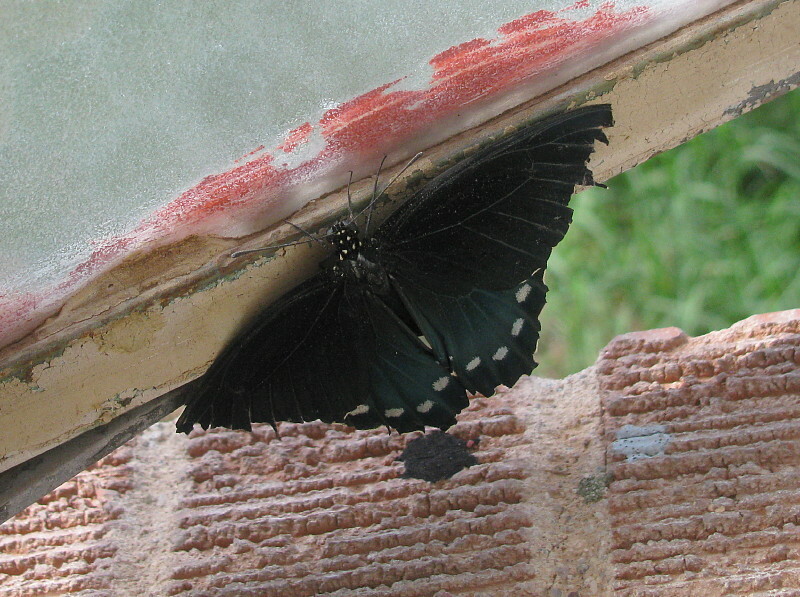 I was in my bathroom when I heard the fluttering of wings in the casement window. 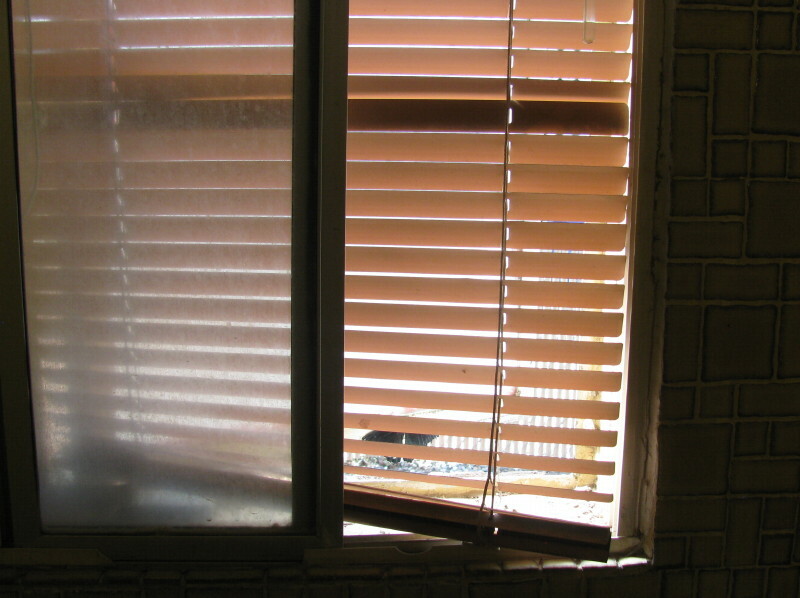 It was a butterfly, sort-of trapped between the pane of glass and the venetian blind, batting its wings ragged rather than easing out through the opening it probably used to get in. I pushed the blind out of the way and nudged the window further open. The butterfly just hung there, resting, giving me plenty of time to go for my camera. I think it's a pipevine swallowtail, the same kind that was so common out in Oro Valley; but this one had barely a hint of blue on its wings, and if it ever had a swallow tail the feature had been sacrificed to the creature's accidental self-harm. 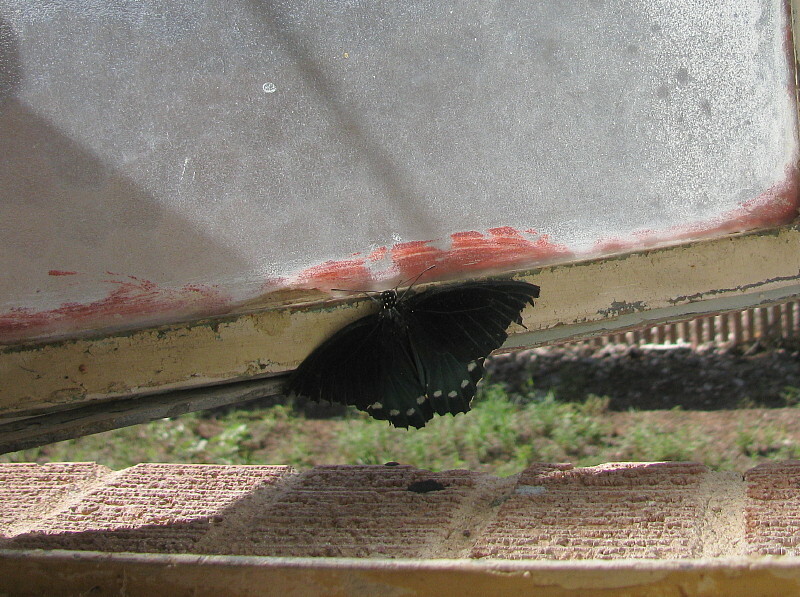 Still, it survived its ordeal, and flew away shortly after I left for church. And John says there are three pupae at the top of that same window. Perhaps we'll see brand new butterflies, alive and whole, before too long. Meanwhile, I need to wipe up the sad flecks of butterfly wing that are currently littering my bathtub. Let's finish up with another kind of moving object, also trapped in glass. 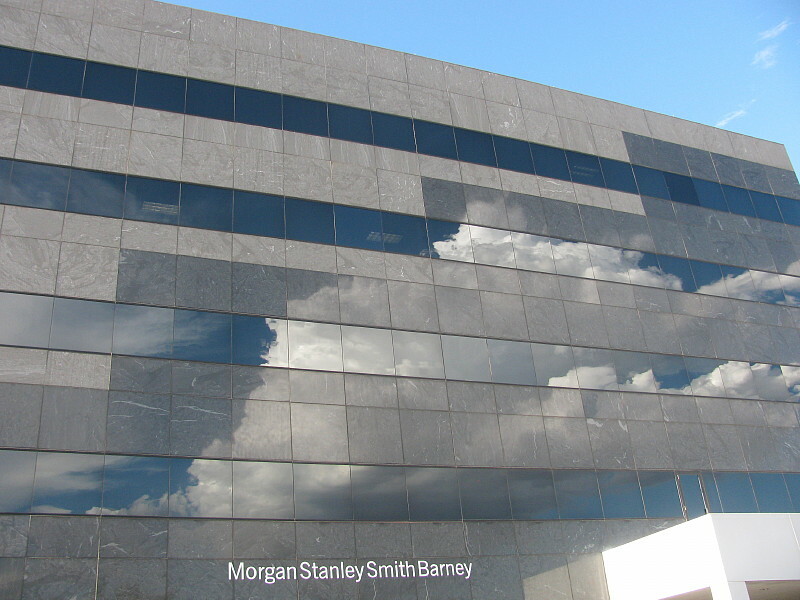 I've been sitting on this shot for a week or two: clouds reflected in the Williams Center building where one of my recruiters has an office. My entry for Round Robin Challenge: Express A Feeling is going to be a bit on the experimental side. As you may have noticed, I don't take many pictures of people's faces. I don't like to intrude on people's privacy. 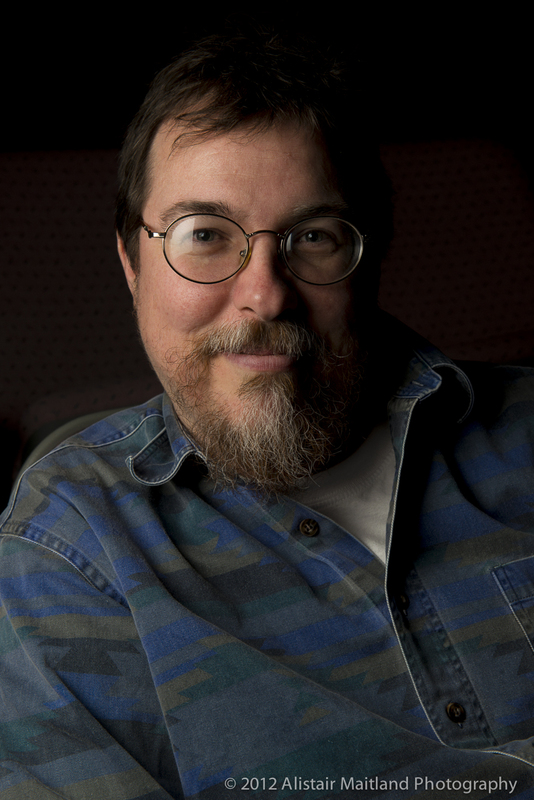 John forbids me to post his picture in any case, and there's really nobody else I feel I can ask to pose for me. So to "express a feeling" in this entry (as suggested by Lisa of Lisa's Chaos in 2008), I'm going to rely mostly on a building and some sky. I'm also going to cheat a little, and tell you about the building. See if you can guess what feeling is expressed here. The main entrance to Devon Gables, as seen from the annex parking lot. This is a place called Devon Gables. I don't want to call it notorious, exactly; in fact, I don't want to criticize Devon Gables as an institution or disparage any of its personnel. 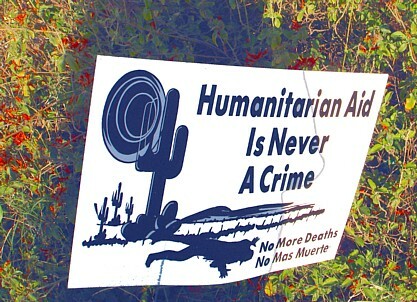 But it's a very well-known place in Tucson. If you live here and are old enough to have aged parents, friends with health issues that come with age, or even health problems of your own, you probably have heard of the place. You may even have walked its halls, or been pushed down them in a wheelchair. Devon Gables is a combination rehab facility, nursing home and assisted living center, one of the largest in town. My mom was here, circa 2001 and 2002, twice I think. They were supposed to be teaching her how to manage her ostomy, but it took her a long time to learn to cope. She was at Devon Gables on an awful Christmas Day, possibly her last Christmas. I brought her presents there. Another time, in this place where the lights are on 24 hours a day, she called me on my new cell phone at 4AM, not realizing what time it was. I had it on the charger so it didn't ring; instead a voicemail prompt played, from the (male) previous owner of that phone number. My mom left an angry message about her paying for a phone so that John (she thought the recorded voice was John, live) could hang up on her. A welcome to their home - but how homey is it? One thing I'll say for Devon Gables: it tries to be welcoming and homey. Emphasis on the word "tries." 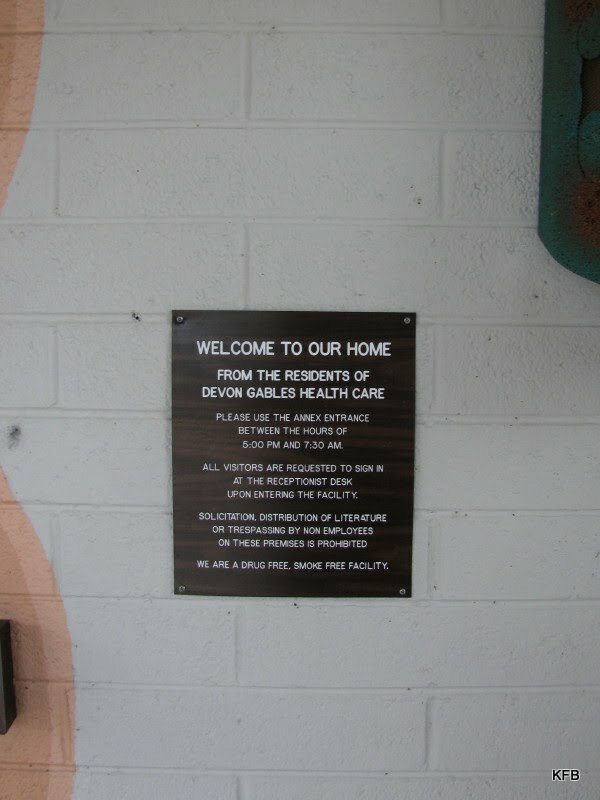 In addition to this sign, the word "WeLcome" [sic] is painted on an otherwise featureless wall of cement blocks outside the annex. 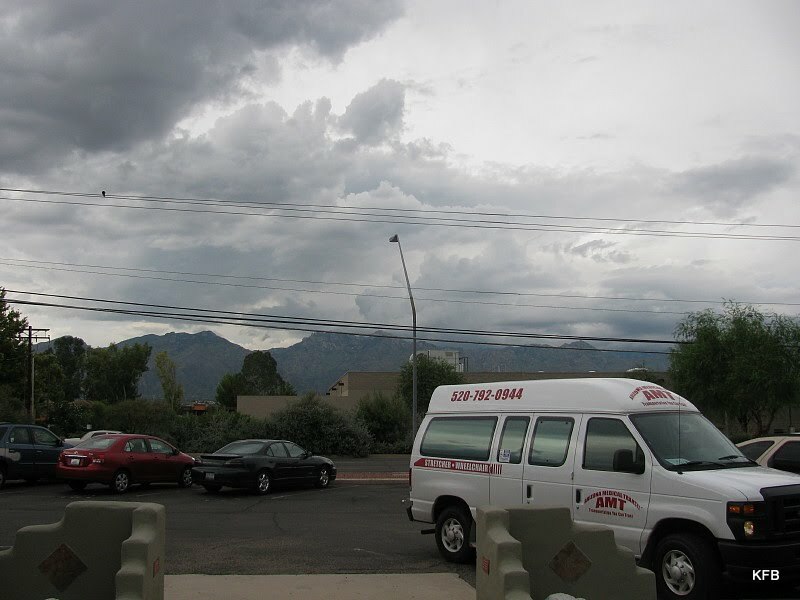 The view from the annex entrance: clouds, mountains and medical transport. It's hard to feel at home, though, in a place that residents typically reach by ambulance or medical transport. Some people, like my friend J., are destined to come to Devon Gables for a few weeks only, to recover from a fall or an illness or surgery before being shipped out again, to their homes or perhaps another institution. For others, this is the last stop, or the last except for some brief, final crisis in a hospital nearby. 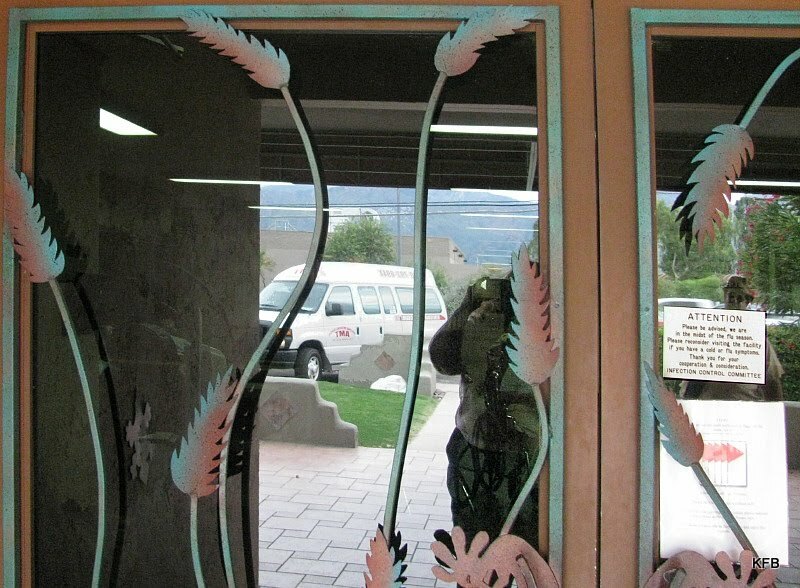 The reflection on the annex doors is broken by iron grain, Kokopelli and my revealing shadow. Still, as I say, they try to make the place look nice and welcoming, decorating it with Southwest colors and iconography - fake prickly pears out front (real cactus might injure someone), Kokopelli in the ironwork on the annex door, saguaro shapes and an incongruous spear hanging on the walls. 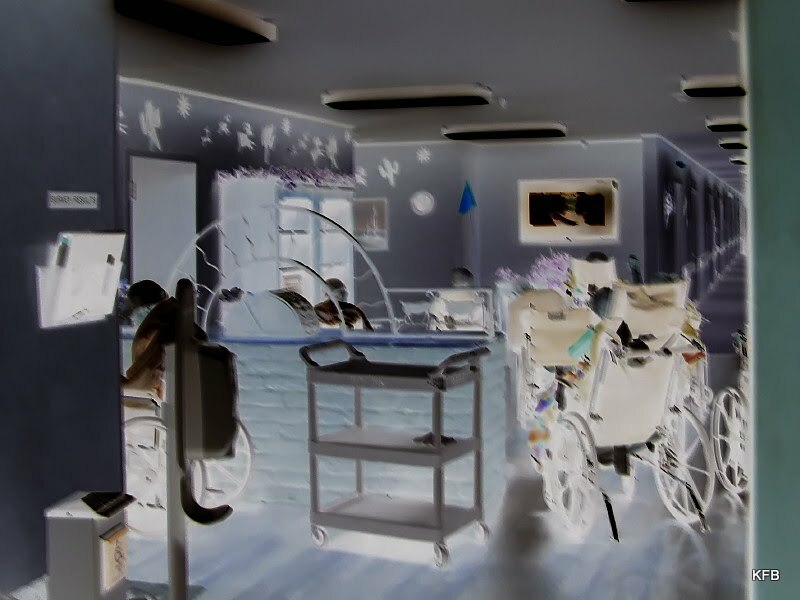 Wheelchairs in a lounge, in negative. Beyond these touches, though, and beyond these doors, the main things one sees are hallway after hallway full of rooms, two beds to a room, and, outside the rooms, lots and lots of people in wheelchairs: mostly not talking, usually barely moving. These people tend to congregate in lounges with a television hanging on a wall. This is odd, because they don't seem to really be watching it, or hanging out with each other. Nor do they necessarily need a lounge to get to a television, judging from J. 's room. She has a little flat screen tv that swings out over he bed on a metal arm, looking very much like a medical device - an X-ray machine, perhaps. J. was watching one of these when Kevin and I stopped by. We didn't stay long, for various reasons. Now let's go this the other Robins' photographic feelings. I feel sure there will be lots of them that are more positive that the one above! In just a couple weeks, students will be heading back to school. Share with us what that means in your life. Are you currently shopping for school supplies for the students in your life? Are you planning on going back to school? Maybe everyone around you is rushing to get ready for the new school year, but you can sit back and relax. Tell us what that's like. I'm going to give you an uncharacteristically short answer, and then move on to another topic. I promise it will be painless - well, for you, anyway! I wasn't able to have kids - a long story which I don't care to discuss right now - so I've never had to go out and buy school supplies for anyone but myself. The last time I was in school was November 2002 to February 2005. My school supplies at the time consisted mostly of a laptop computer and textbooks in book or pdf form. Conventional school supplies are so far in the past for me that I remember buying them at Weber's, a three room department store in Manlius, NY. I haven't lived in Manlius since 1975, and Weber's is long gone. 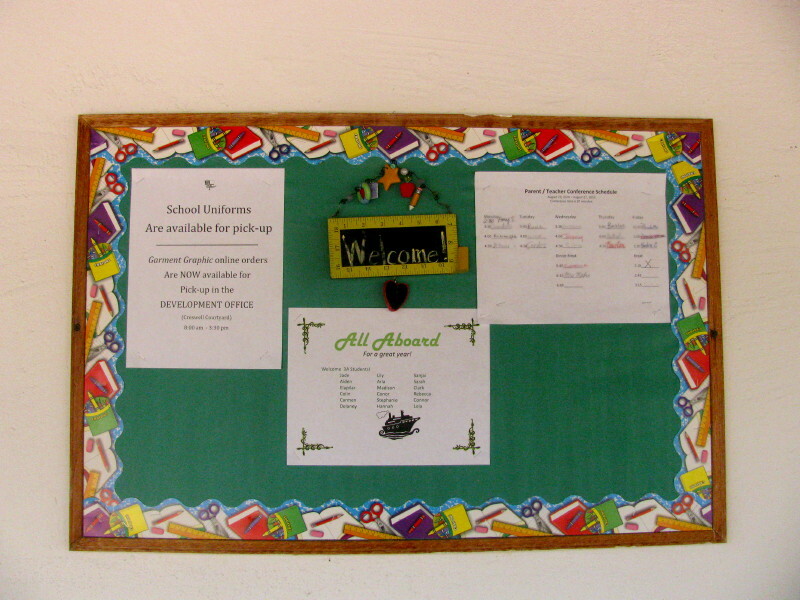 My only contact with school these days is with St. Michael's Parish Day School, which started classes last week. I don't do the school's accounting, and I don't teach there. 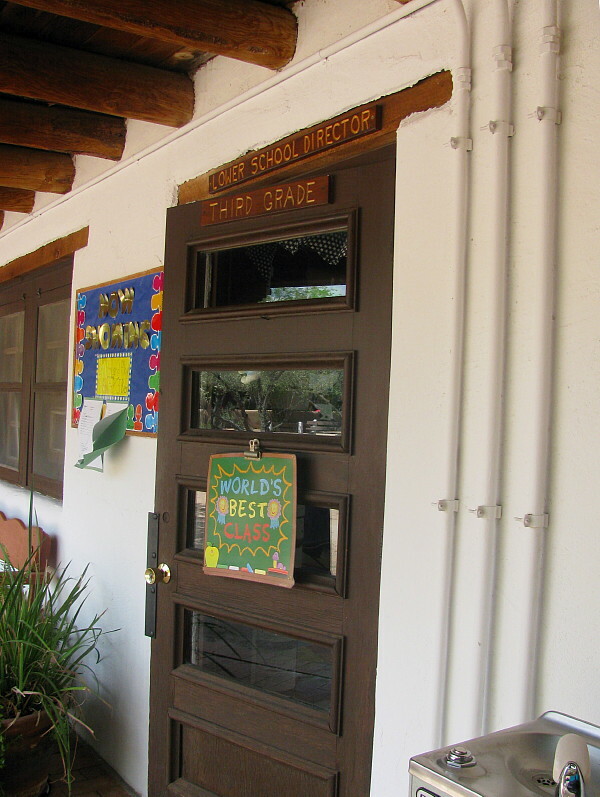 But I do walk past their first through third grade classrooms on the way to the church office where I work. Sometimes I have to step to one side to avoid a gaggle of third graders and their teacher. That's my big concession to the school year: avoiding kids outside the classrooms so nobody gets nervous about a strange adult approaching a small child. There is one other school that I visit once or twice a year. I was there today. Wheeler Elementary is my polling place in November, and sometimes for primaries, and rarely for bond issues. I was there today to vote for the Democrat I most want to see on the ballot against John McCain for Senate, quixotic though that goal may be. Most of the other races in the Democratic primary weren't contested, at least not in my precinct. As much time as I spent trying to research all the races online, from Superintendent of Public Instruction to whichever legislative district I'm in (29 or 30, I think), I still ended up with one race for which I had no cheat sheet and had to take a wild guess from the vaguest of name recognitions. And first day of school? I don't really remember much about the first one in 2002, let alone the one in 1975, when I was in college the first time, or the one in 1962, when I started kindergarten. I do remember that at midyear, my mom pulled me out of my half-day kindergarten at Manlius Elementary, and placed me in first grade at Pebble Hill School in Dewitt. I was told at the time that if first grade didn't work out I could switch to Mrs. Peterson's kindergarten at Pebble Hill, which was all day. (This was the main thing, to give my mom more time to go to work without hiring sitters every day.) That first day, I saw my first word with a silent k in it, freaked out a little, and asked at lunch time to make the switch. My memory is that my request was granted immediately, but more likely it took a couple of days. My first day at Syracuse University was all about colored flyers, a course catalog and orientation, and a stack of punch cards, on for each class I wanted. I truly remember no more than that. 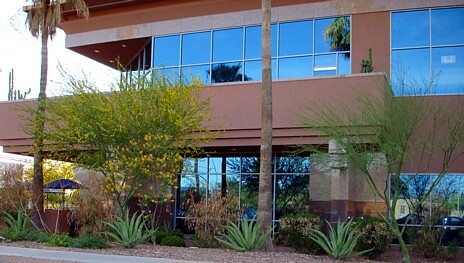 My first day at University of Phoenix in 2002 was an evening class, GEN 300. That course was mostly about how to write a paper, work in teams and avoid plagiarism, with a smattering of pop psychology thrown in. But that's not what I've been wanting to tell you about. 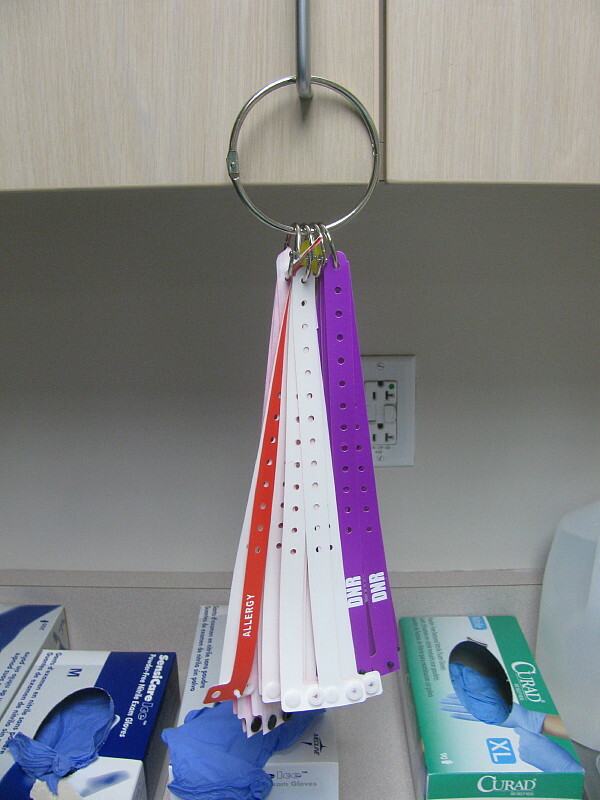 Few places in the world are more tedious than the average ER. 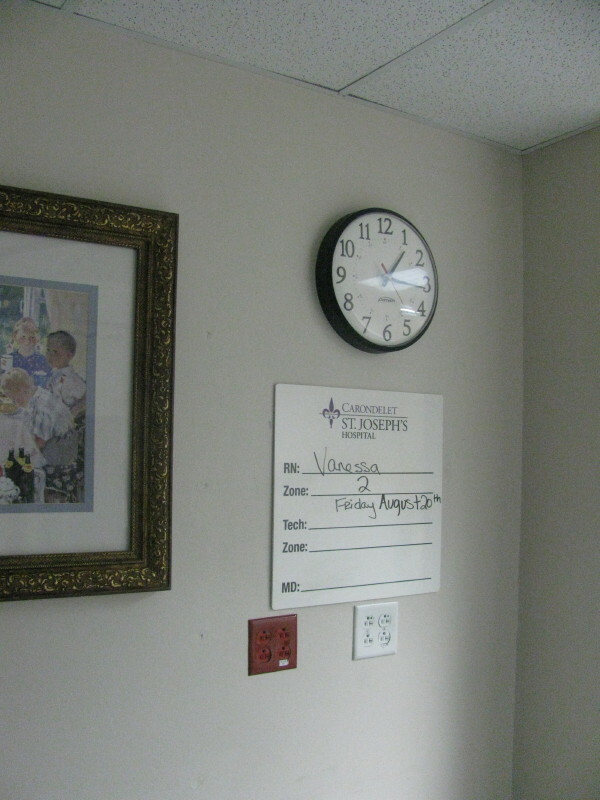 It is a place of waiting - waiting for word of admission or release, waiting for an x-ray or an ultrasound, waiting for a friend or relative, and sometimes waiting to die. I was in the ER today, but not in the way you might think. I was in cubicle 14, waiting. 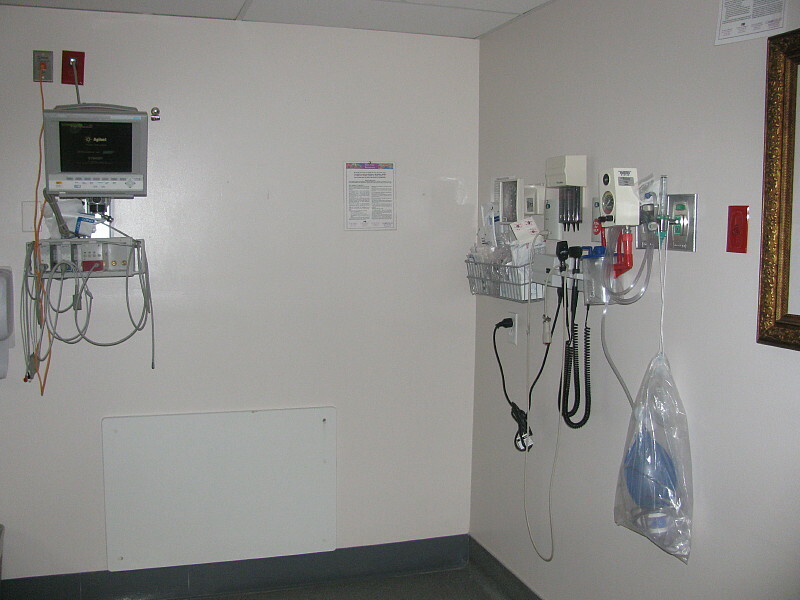 The little partitioned area was utterly empty at first: no bed, no chair, no patient. Bed 14 was supposed to contain my friend, J., but she was off in x-ray. For well over an hour. So I waited. And that was as far as I'd gotten when J. was wheeled back in. She had fallen at Borders, possibly tripping over one of those little stools on wheels that bookstores use for reaching the top shelves. J. had hurt her knee and was in a lot of pain. Before I left, the doctor on duty came in with the preliminary results of the x-ray. J. had fractured her knee, badly. The knee was unstable, and would need pinning. An orthopedic surgeon had been called, and would be operating on her on Saturday. J. would have to wait to find out whether she would fly to West Virginia in mid-September to celebrate her 62nd birthday with a family reunion. It turned out that this didn't happen as advertised. The operation was Sunday, and they put a whole plate in. So much for getting through metal detectors, but that's moot for now anyway, because she'll have to postpone that trip. But here's the thing. As tedious as that Friday afternoon wait was, I was quite impressed with the nurses, doctors and EMT there. They were extremely responsive and patient, not just with J. but also with an abusive drunk down the hall, and even with me - they brought me a chair to sit on. The men and women of the Carondelet health system, which also runs St. Mary's on the west side of town, really seems to take "a mission for healing" seriously. Good for them. 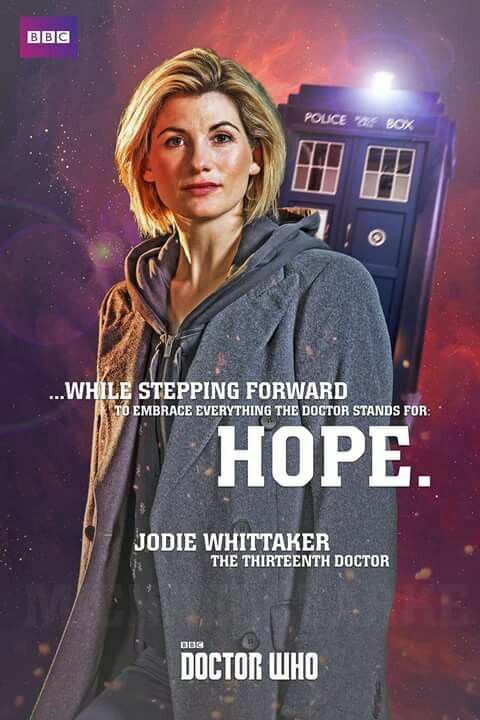 That goes a long way toward making up for the doctor in that same hospital in December, 2002, who told me that they would be moving my mom to a hospice if my mom didn't hurry up and die (my words, not his). 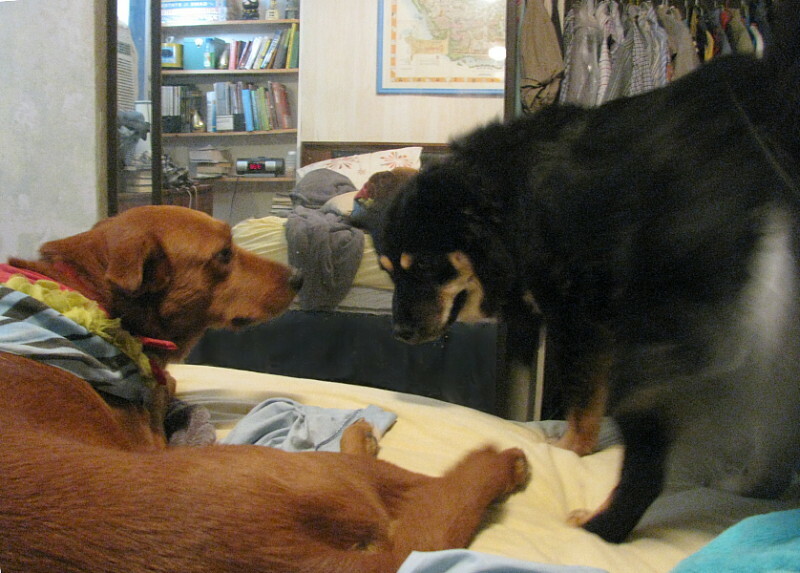 She accommodated him about half an hour later. And the other people at the hospital that day were wonderful. That, by the way, was also the last day of my GEN 300 class. I had to go to class about eight hours after my mom's death, and participate in my team's PowerPoint presentation. Ah, school. Can't say I miss it much. For EMPS this week, Carly asked to see billboards. I haven't been by any good ones lately, but I have a few things in my files that may be of interest. I don't think I've posted any of them before. Well, except for the St. Michael's one, which I've just cropped. 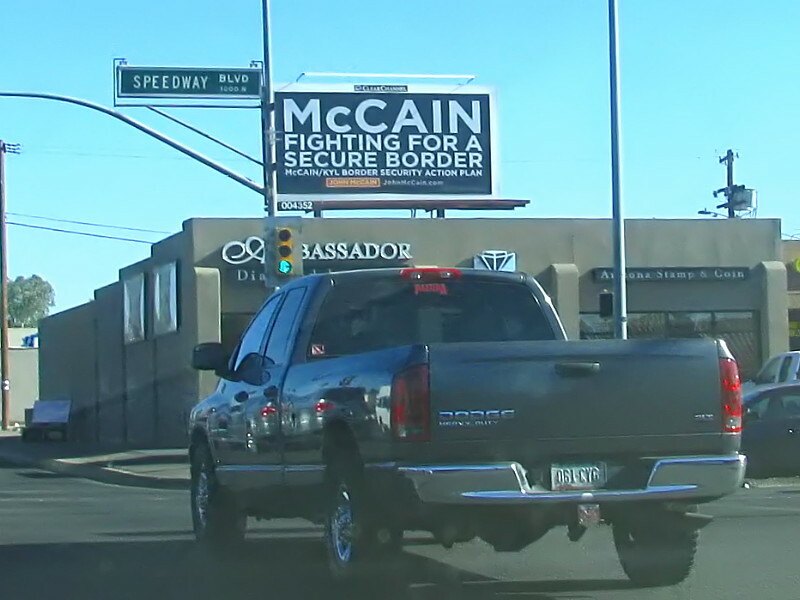 From June - John McCain's billboard turns its back on his past advocacy of immigration reform to pander to the xenophobic right. 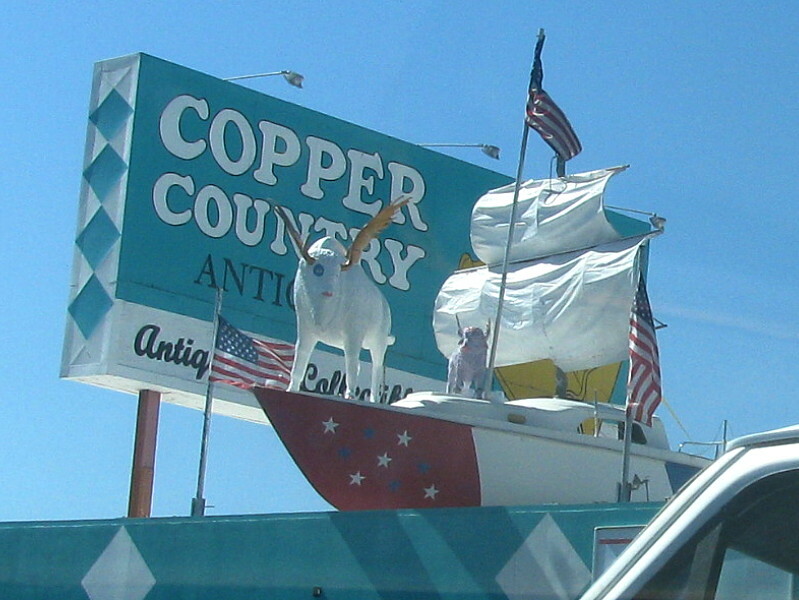 From May: Fred and Little Freddie, the two improbably colored winged bison, block part of the Copper Country billboard. I don't think anybody minds. 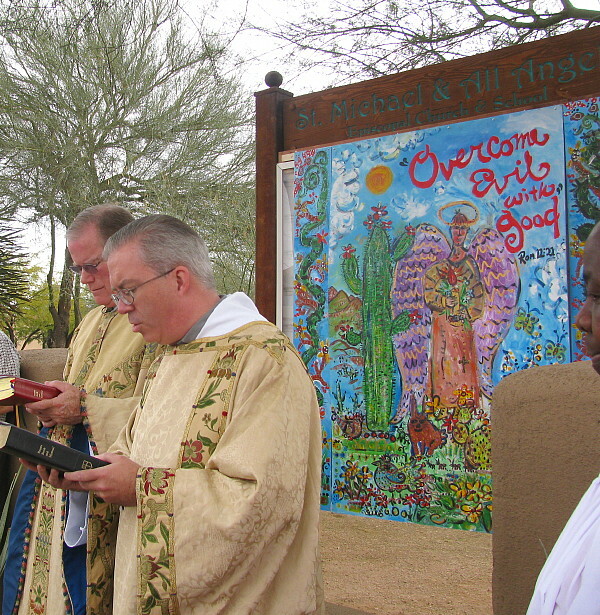 From January: the new artwork, "Overcome Evil with Good," is blessed and dedicated on the St. Michael's prophetic sign. Does that count as a billboard? To get anything really interesting and regional, I'd need to drive out of town, north on I-10 West or southeast on I-10 East. This photo dates back to a trip to IKEA outside Phoenix in 2005. 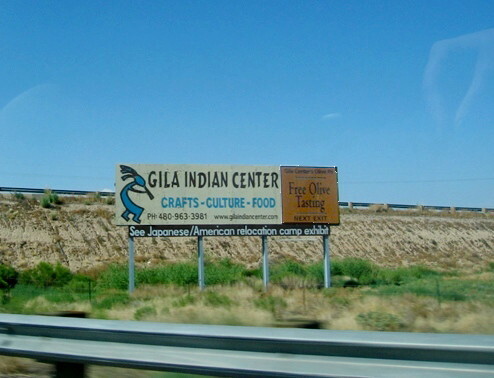 Real and fake Indian crafts, olive tasting and a Japanese-American interment camp (exhibit), all at one convenient stop between Tucson and Phoenix! I had hoped to find you a picture of one of the billboards for THE THING? MYSTERY OF THE DESERT!" east of Tucson, but apparently I've never managed to photograph it at 75 mph. Which is better -- cake or pie? Explain your reasoning. Will you choose the moist sponginess and frosting-topped goodness of cake? Or will you side with those flaky crust-adoring, fruit-filling fanatics of the pie nation? You must choose one -- and only one! No trying to suggest that Boston Creme Pie is really kind of like a cake, or how cheesecake is actually not unlike a pie. Take a stand! Be true to your pastry orientation! Extra Credit: Having chosen cake or pie, now admit your favorite variety of the dessert you did not choose. So if you chose cake, tell us your favorite pie. Prefer pie? Tell us your favorite cake. - J.S. One thing I will say in praise of pie is that it has a much better literary pedigree than cake. What are the great cake references? You can put 16 Candles on it, or you can behead a queen after she says something stupid about letting peasants eat it. That's about it. Ah, but pie! Simple Simon met a pieman, four-and-twenty blackbirds survived being baked into a pie, and Little Jack Horner pulled a plum out of his Christmas one. Don McLean managed to combine pie with the history of rock and roll in one of the longest hit singles ever (at least on 45). The less said about a series of raunchy films, the better. Apple pie is a symbol for America, along with baseball, hot dogs and, according to a 1960s ad campaign, Chevrolet. Dean Martin wants me to remind you that "When the moon hits your eye like a big pizza pie, that's amore." The Jeffersons finally got a piece of the pie. Fox Mulder ate a long series of pie slices while interviewing a waitress, according to Jose Chung (Charles Nelson Reilly, in his best role ever) in my favorite X-Files episode. And wasn't Agent Cooper fond of pie also? Many people ask what are Beatles? Why Beatles? Ugh, Beatles, how did the name arrive? So we will tell you. It came in a vision--a man appeared in a flaming pie and said unto them 'From this day on you are Beatles with an A'. Thank you, Mister Man, they said, thanking him. --from "Being a Short Diversion on the Dubious Origins of the Beatles" by John Lennon, Mersey Beat, 1961. Paul McCartney later named an album Flaming Pie in honor of this "diversion." But let's plunge in again. This time around, I'm voting for cake. "John, the Weekend Assignment is time is 'Cake Vs. Pie.' 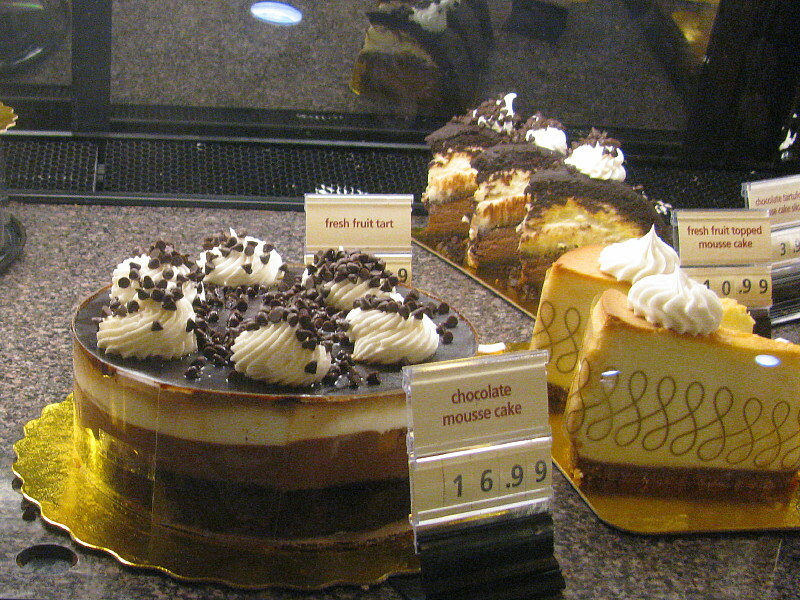 I'm going to Safeway to photograph cake and pie, and I'll probably bring home a piece of one or the other. Do you need anything from the store?" Yes, I was thinking cake also. John and I hardly ever buy cake or pie, but sometimes these things take on a life of their own. Many of the cakes at Safeway involve chocolate. I'm in favor of pretty much anything chocolate. Well, as long as it doesn't involve coffee also. Yuck. Phooey on coffee anything. 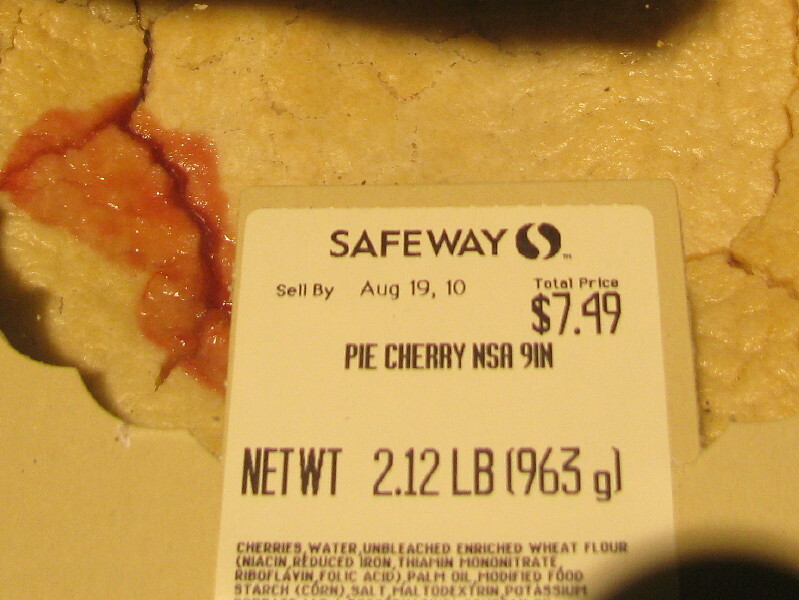 There was very little pie on display in the bakery, just "NSA" (no sugar added) cherry, which would be my choice if I were buying pie, and Dutch Apple, and custard. I love custard, but almost never buy it in pie form. The main problem with most pie, to my mind, is that it needs ice cream or whipped cream to make it worth eating. The exception is my favorite pie of all, pumpkin, along with its variants: pumpkin cream, pumpkin chocolate torte, pumpkin tart, harvest pie, etc. But try to get any of those this time of year. 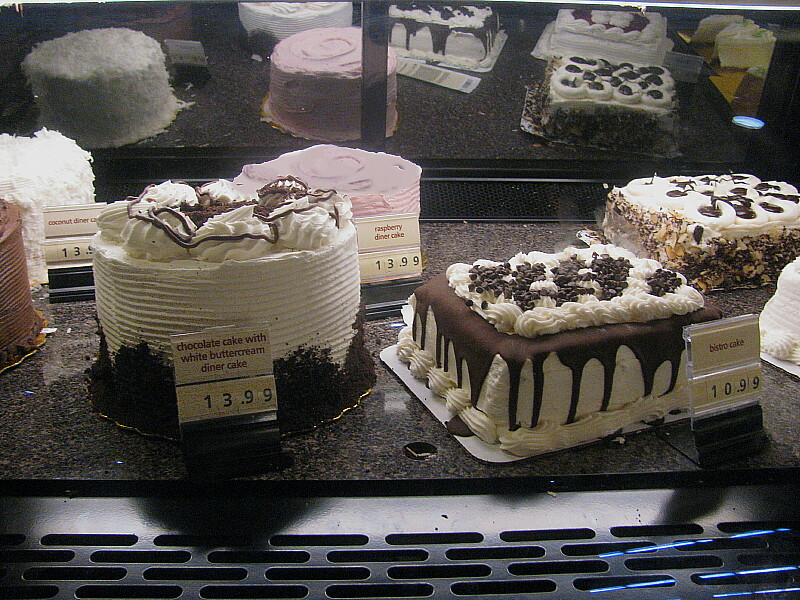 On the other hand, Safeway had lots of choices with cake in the name, most of them quite inviting. Okay, cheesecake might be cheating, but what about Boston Cream? It often has the word "pie" attached to it, but clearly it's a cake. Safeway had theirs labeled "Boston Cream Cake" - and quite right, too. 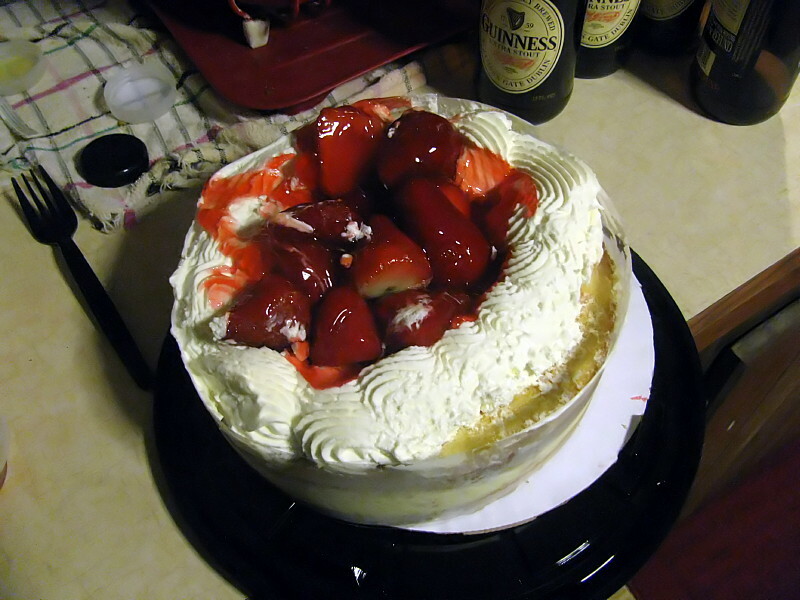 They also had a "Boston Cream" variant, with fresh strawberries on top and no chocolate icing. 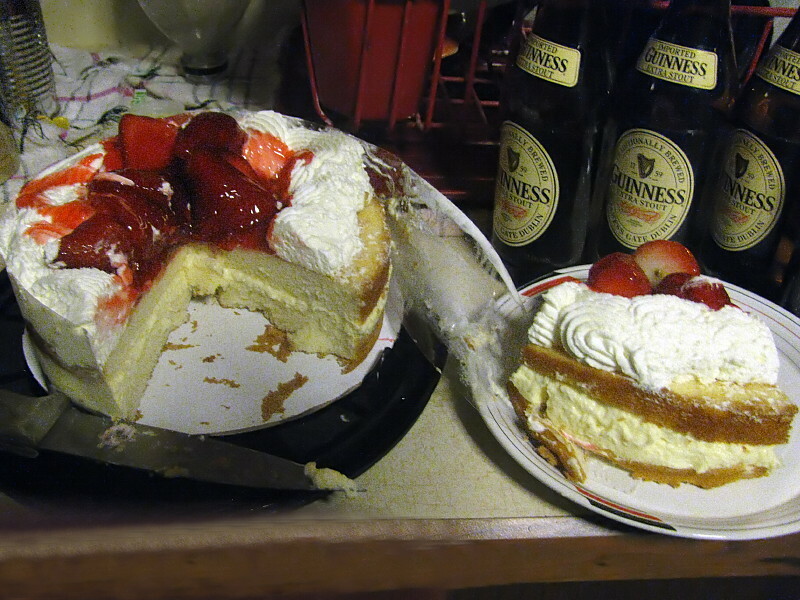 To my mind, that's more of a strawberry shortcake, but it's still a cake. I chose that (it was on sale) and took it home. Unfortunately I did a poor job of carrying in the bag and upended the whole thing, but I managed to smoosh it back together. And John and I definitely thought it tasted good. Even without chocolate. For Ellipsis Monday Photo Shoot #102: It's All A Blur!, Carly wants to see something that's blurry or blurred - not by inept photography or due to limitations of a camera, but out in the world. Tricky, but I did come up with something. It's been miserably humid today. The airport got 0.03" of rain last night, but I don't think that the thunder I heard for the second night in a row was followed by a drop of rain here. It was very hot and humid in the church this morning under my alb (a plain, white, long-sleeved vestment), and I was sweating and panting before the morning was over. 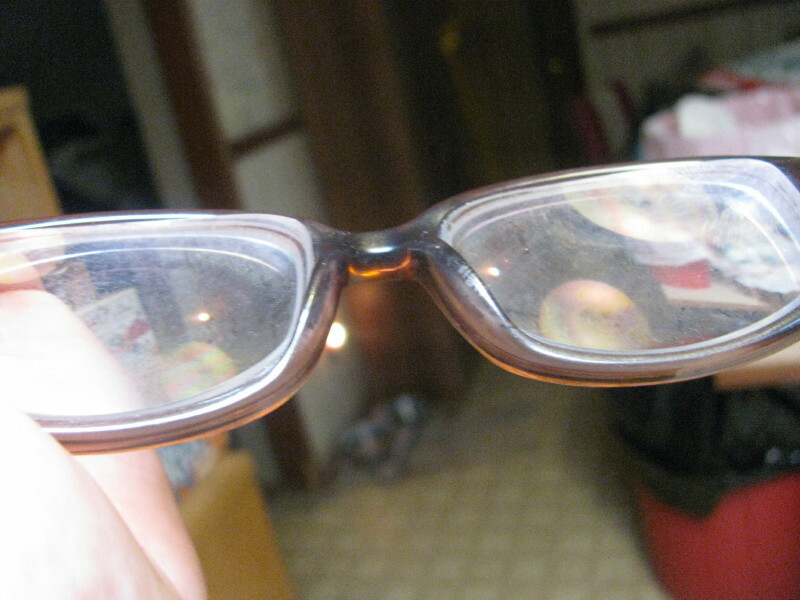 Some of that moisture found its way onto my glasses, blurring my vision more than it is already. Here's the main thing I want to show you. 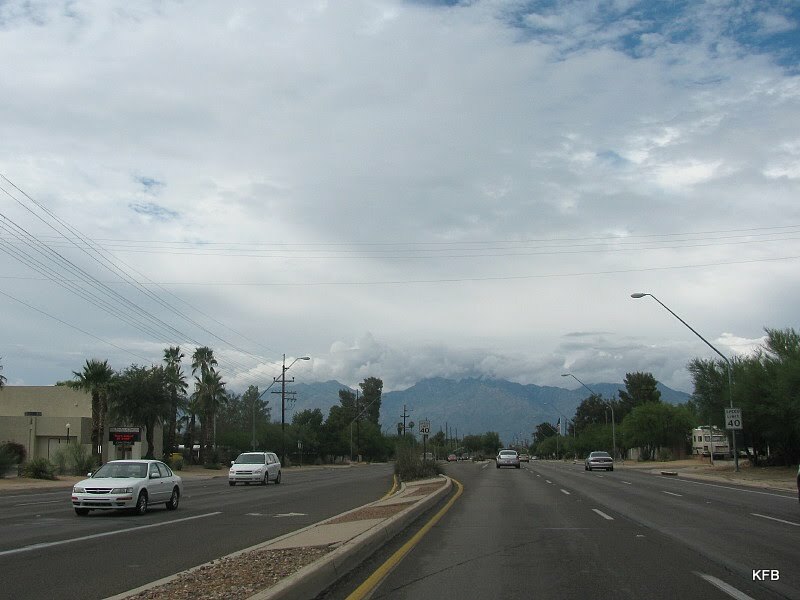 One common feature of the monsoon, as I mentioned Friday night, is the buildup of clouds over the mountains, which sometimes blurs the visual distinction between land and sky. How quickly can you spot the mountains in this picture? That was a relatively easy one. 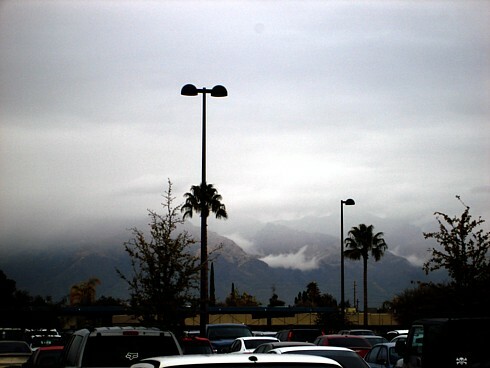 There are times when clouds obscure the mountains entirely. Here's a slightly more extreme example from 2006. 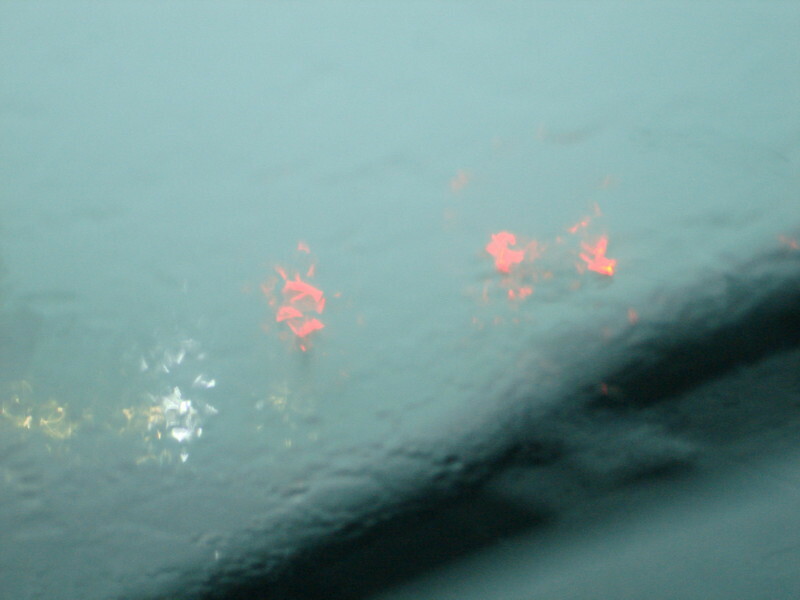 Continuing my theme of weather-related blurring, here's a shot taking during a monsoon thunderstorm on July 31, 2007. 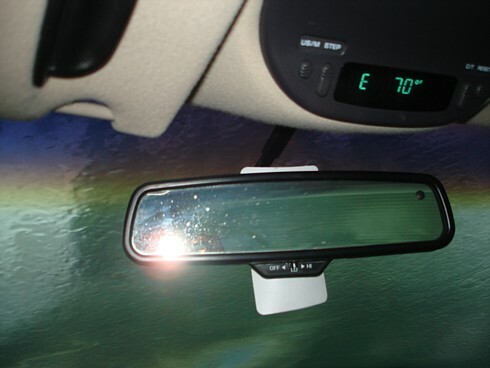 I don't think I've driven in worse visibility than Southern California fog, but Florida storms are a close second, and Arizona ones, at their worst, aren't all that far behind Florida. And I love it. I am posting this particular shot for the first time; there are even more extreme ones from the same day that I've used before. From the same day: I remember this moment. For once I actually sat in the parking lot at First Magnus, watching the temperature fall and waiting for the rain to ease off a little before driving away. A promising cloud build-up on the last day of July. Well, that was a total bust. 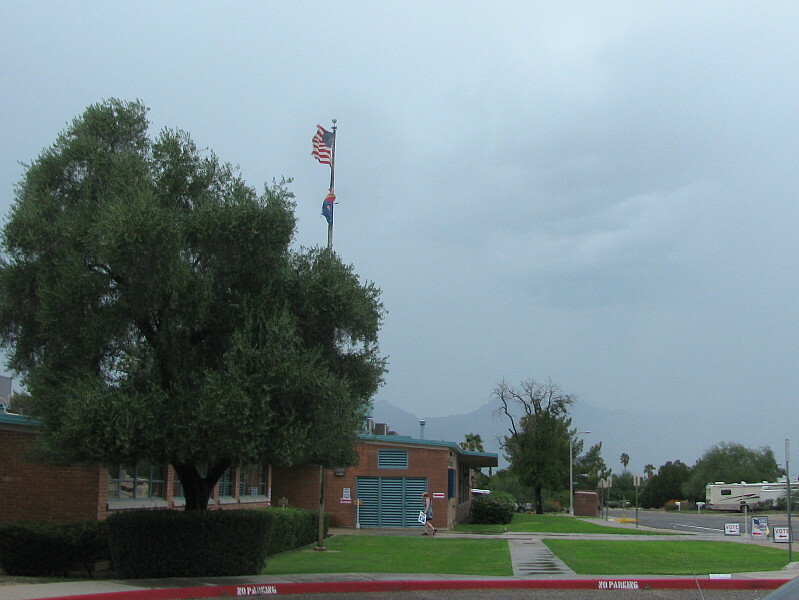 When I proposed the Round Robin topic "About the Weather," based on suggestions by Steven of (sometimes) photoblog (now defunct) and Julie of Julie's Web Journal, Tucson had just had a reasonably spectacular thunderstorm as part of our annual Arizona monsoon. Prime time for the monsoon is July and August, so I thought I'd almost certainly be able to photograph some more dramatic weather for you. If it didn't work out, I'd show you the less-dramatic weather we got instead. And if all else failed, I could always go with photos of dramatic weather from past years. The day after the rain: Alamo Wash on July 31, 2010. Plan B it is, then. 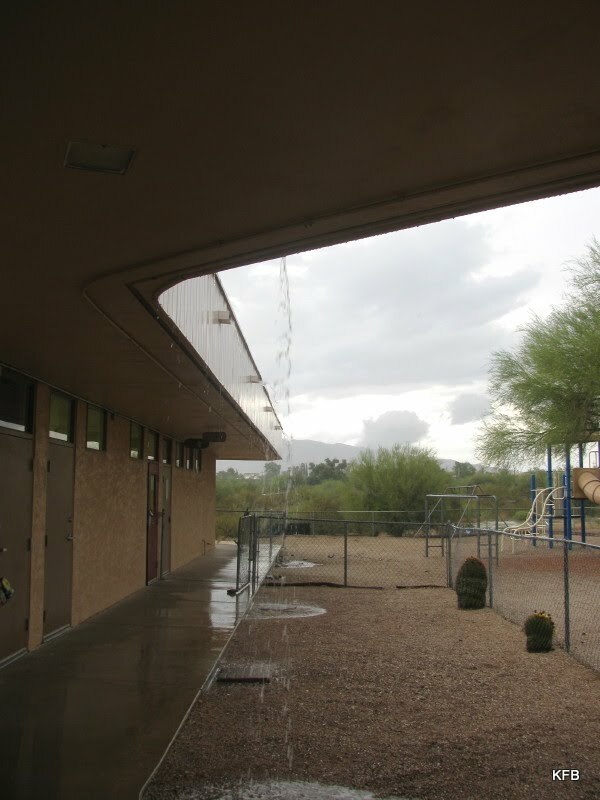 You know how much rain Tucson has had in August? A tenth of an inch. Phooey. Average rainfall here in August is supposed to be 2.3", so we're well behind. 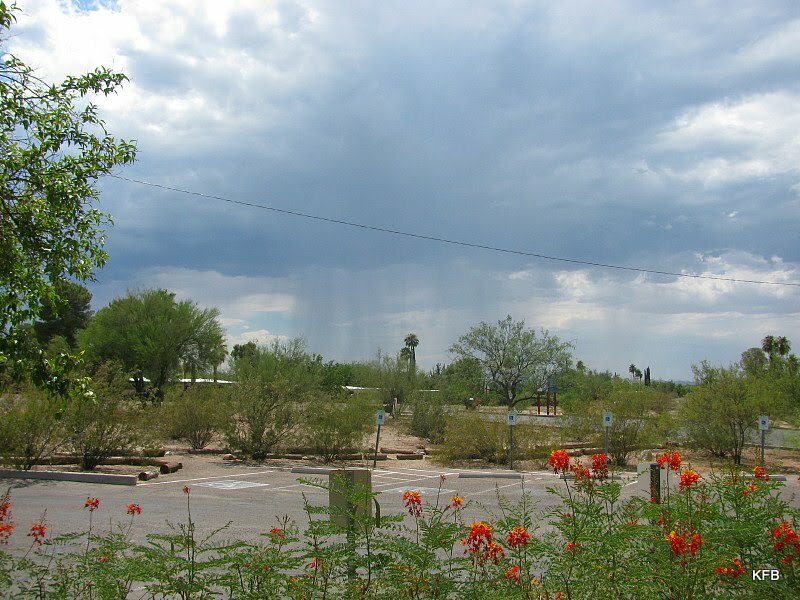 Last year's monsoon fizzled in August also, with a total rainfall of 0.33" for the entire month. I wouldn't be at all surprised if our decade or more of drought turned out to be due to climate change. 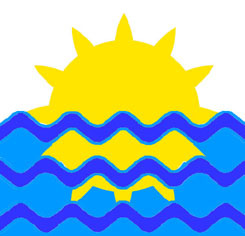 During 2001 to 2009, three years had a total rainfall for the season (mid-June to mid-September) of under three inches each, less than half of the current century-plus average of 6.06". Clouds over the mountains - and nowhere else. 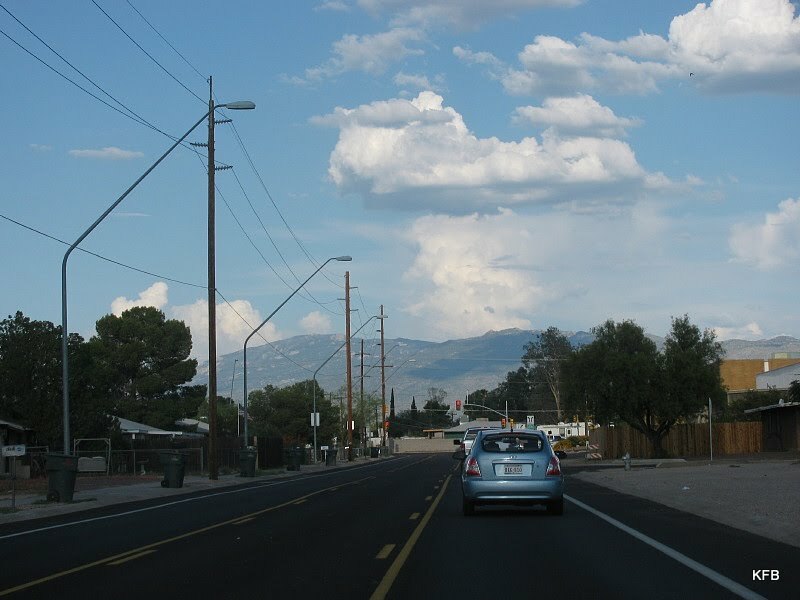 What typically happens is, we get a nice buildup of clouds in the afternoon, almost all of it over the mountains that surround the city. 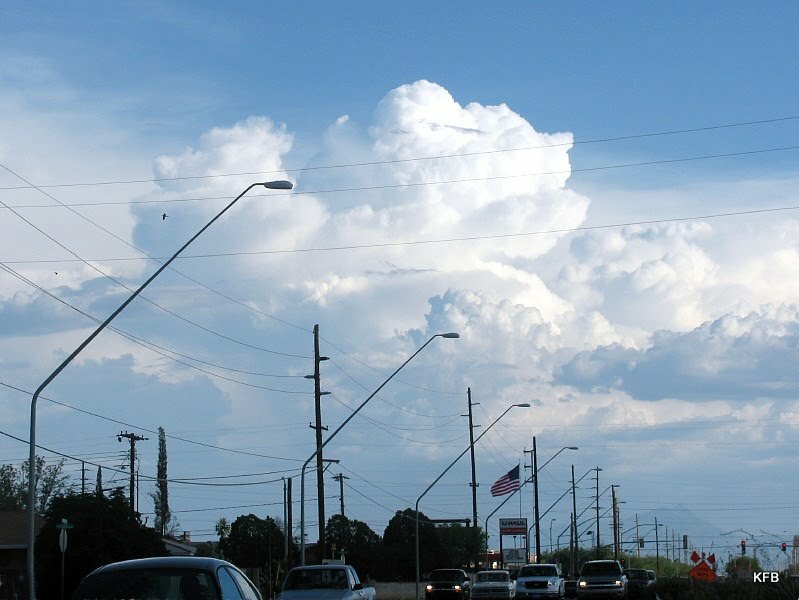 If the clouds spread to the sky overhead, an actual thunderstorm starts to seem likely. All too often, though, it rains over the mountains and leaves the city gasping for water - or it dissipates entirely, with no rain in the area at all. 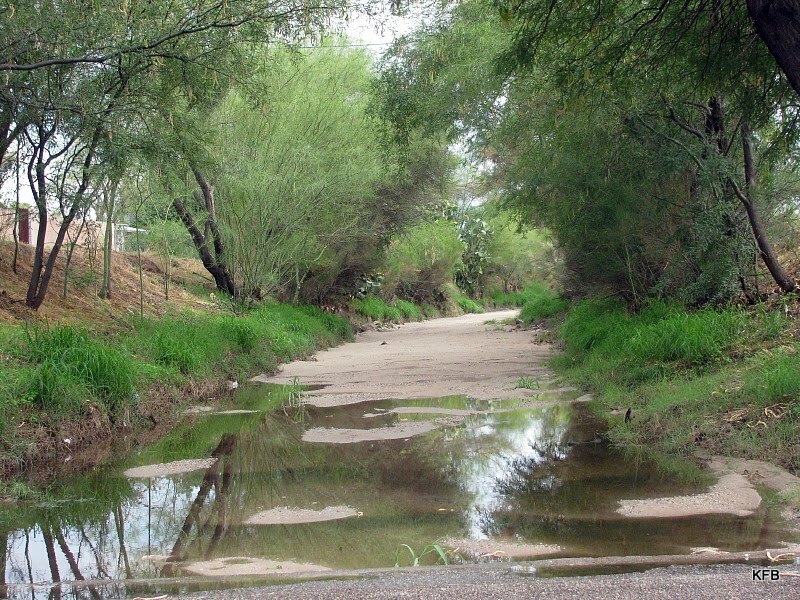 We're supposed to get about 11 inches of rain a year here in the desert, just over half of it during the monsoon. All too often recently, the monsoon hasn't done its job. Over the past decade, we've only had three years of above-average monsoon rainfall - and two of those were above average by less than three quarters of an inch. dewpoint is 54 degrees or greater for "3" consecutive days. The start date is the first of the "3" consecutive days. What I didn't know was that NOAA decided several years ago to stop naming the official start of the monsoon by this definition, probably because it's hard to compare monsoons from year to year without using the same date range for each. Now the monsoon officially starts on June 15th, whether the sky is ready or not. This year it wasn't. We had just under a quarter of an inch of rain in June. When it does rain, it can make a huge difference in the temperature. 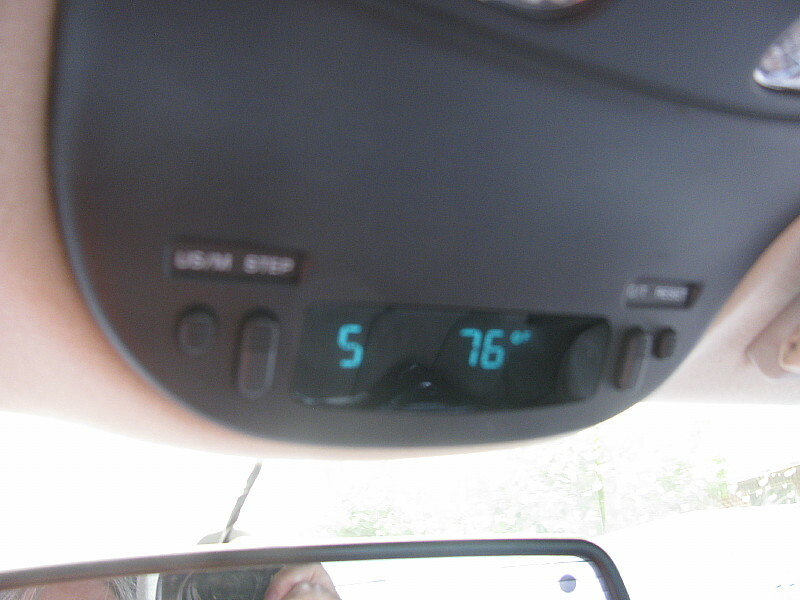 Trust me, 76 degrees is unusually cool for a Saturday morning at the end of July! Still, I should be grateful for the 2.30" in July. Besides, the season's not over yet. We may yet get a gullywasher or two. P.S. It's 4:18 AM, and I just heard thunder! Hooray! So did Cayenne, and she's come to me for comfort. Sherrie **new blog! ** - Posted! I got a voicemail tonight from Rita at Arizona's Department of Economic Security (DES). My weekly claim for unemployment benefits (I stand to get about $40 to $50 this week from the combined state and Federal governments, representing a total of $240 less my earnings) was not processed because of wages earned in the State of Florida. Say what? The only time in my life that I actually lived in Florida was in 1976 when my mom moved to Cape Canaveral after the divorce. I did not have a job that summer, and haven't visited that state at all since 1993. So I was hard pressed to figure out what the State of Arizona was talking about. Was it the $27 refund against a fraudulent charge on one of my credit cards? Had someone at DES accidentally entered a Florida church called St. Matthew's or St. Michael and All Angels into my electronic file? Did it have something to do with the First Magnus bankruptcy and lawsuit? Back in January, I wrote about two pieces of long-awaited mail I had just received. One was a paycheck for $186.72, more than tripling what I had been paid to date for my last two weeks of work at First Magnus Financial Corp in August 2007, leading up to the day the company collapsed. The other was for $706.43 after taxes, in settlement of a class action lawsuit against the company for closing its doors without proper notice to employees. Apparently the Binford Vs. First Magnus Capital settlement check was issued in Florida, and I hadn't noticed. This was the check that DES misinterpreted as 2010 wages earned in the State of Florida. 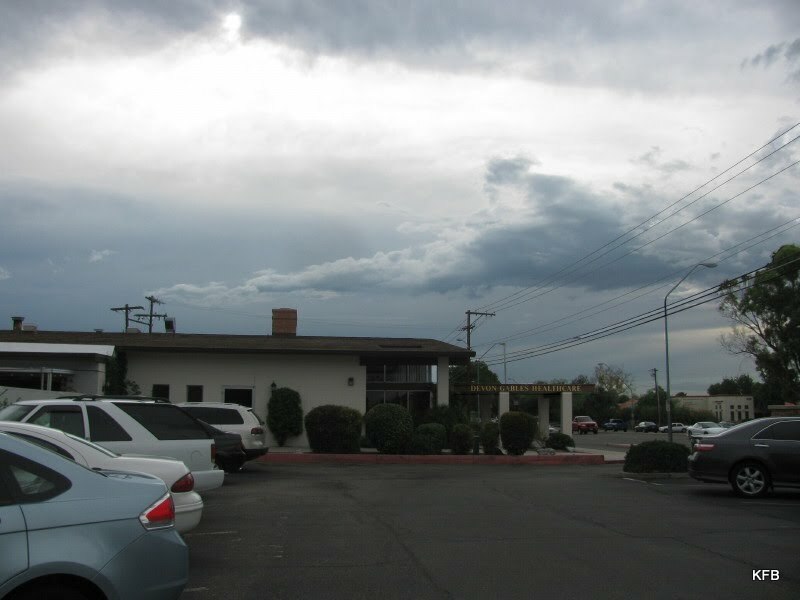 The national headquarters of First Magnus, which was where I worked back in 2007, was at the corner of Fifth and Wilmot in Tucson, directly across the street from St. Michael and All Angels. First Magnus had branch offices all over the country; the class action suit was probably filed by someone from one of its Florida branches. When I got the voicemail tonight (my cell phone had fallen out of my pocket), I called back and waited on hold for half an hour, which isn't bad by DES standards. The deputy who eventually answered was Rita, the same person who had left the message. Together we worked out what this Florida income was. I explained that it was a settlement for company wrongdoing, not wages for working in Florida. Rita documented all this clearly, and resubmitted my weekly claim, the third attempt to do so. It was at about this point that Rita called back. She had sent the claim in with the explanation, and a supervisor was apparently not satisfied. They now are requiring me to write a letter explaining the situation, which I am supposed to fax to them at 602-364-1210. I intend to send them a copy of this blog entry, or some version thereof. That way they have the explanation in detail, and also know that I've gone public about it, for whatever that's worth. 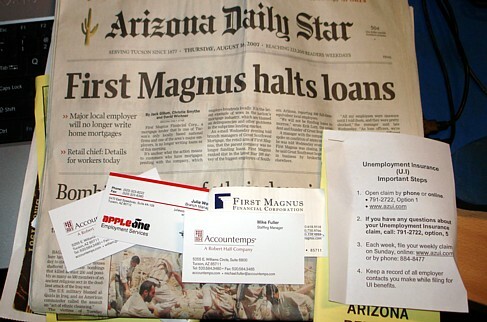 I have to wonder whether this is happening to any of the other 500+ former employees of First Magnus in Arizona. I can't be the only one who has had difficulty remaining fully employed since that dark day in 2007. Let me make this as clear as I can, to my readers and especially to DES. I have received two checks this year related to First Magnus Financial Corp, a company I last worked for on August 16th, 2007, the day I and nearly everyone else cleared out our desks. One check, administered through a liquidation trust, was for $186.72, in partial payment of back wages from August 2007. 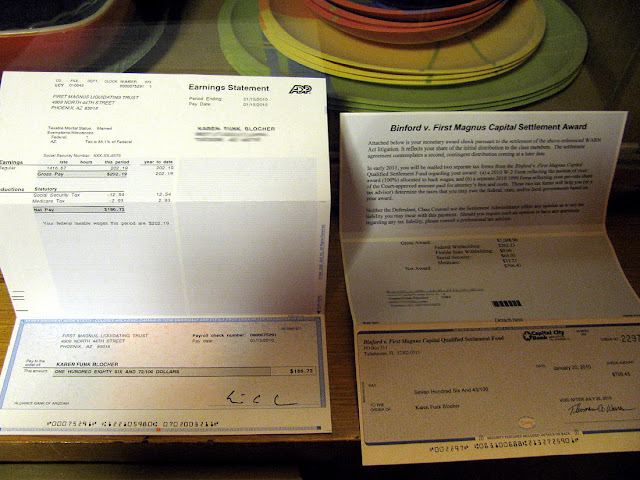 The other check, labeled Binford v. First Magnus Capital Settlement Award, was my portion of a class action settlement in a dispute between former First Magnus employees and one of the corporations related to FMFC, namely First Magnus Capital. (I believe FMC existed mostly to protect certain assets from FMFC creditors.) Neither check was in payment of wages earned after August 16, 2007, in Florida or anywhere else. The check for $706.43 was not for wages at all. It was in settlement of an action against FMFC for closing its doors without any advance notice to employees. I've also discovered a possible reason why all this came up this week, just before the three year anniversary of First Magnus's collapse and eight months after the issuing of those two checks. In the unopened mail from this week (which I'm going to take over opening because John hates it so much) is a W-2 for 2008, replacing a 1099 that the First Magnus Liquidating Trust issued instead. The total amount of the wages paid to me in 2008, for which all this paperwork is necessary, and probably including a revised tax return, is $70.83. Like the $186.72, it represents a partial payment of my back wages from early August 2007. They still owe me about $600, but I'm not holding my breath. I'll let you know whether I get the $40 or $50, or indeed any further unemployment benefits. If I were the paranoid type, I'd think this had something to do with my Tuesday night blog entries. But that's just silly, right? Time to flex your writing muscle again, because for this week only, the Weekend Assignment blog is being changed to The Weekend Assignment Chronicle! Now, we need some Op-Eds to make things a little more interesting around here. Your assignment is to pick a current event and write your opinion regarding it. Anything goes. Write about politics, the economy, or maybe even your opinion about an incident in pop culture. It's all good. It's good to exchange opinions, especially when it's done with respect. So, feel free to speak up here! Extra Credit: Do you read the Op-Eds? Yes? No? Tell us about it! 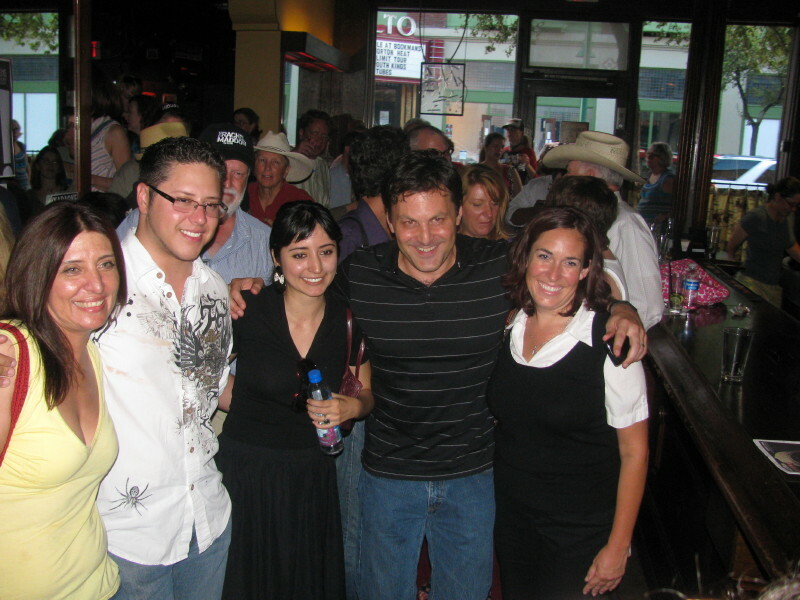 August 2007 - my personal economic crash as my employer went bankrupt. As someone who has been unable to find full-time, permanent work as an accountant since the third economy-devastated industry I worked in laid me off over two years ago, and as someone who manages the finances of a disabled woman who lives on Social Security and food stamps, I'm frustrated with pretty much all levels of government right now. Congress is reducing food stamps, squeezing our poorest people on the grounds that the government can't afford to help them, and besides, maybe they're just lazy and don't deserve our help. They also spent months refusing to extend unemployment benefits for millions of Americans, people made chronically jobless by our faltering economy. (They finally got the bill to go through when the late Senator Byrd's replacement was appointed.) Even when this bill was passed and signed into law, it only extended unemployment for people like me, who are not past the 99 week mark in their unemployment benefits;. It does not help my brother, or any of the other "99ers." What Republicans and deficit-hawk Democrats don't tell you is that benefits for the poor and the unemployed are generally accepted by economists of all ideologies as the most economy-stimulating spending there is. Money paid to such people is likely to be spent immediately on food and other necessities, which helps to keep people employed who sell the food and necessities. The poor and unemployed also pay sales tax, putting money into the empty coffers of financially-strapped states and communities so they don't have to lay off teachers and police and firefighters. Republicans insist that we can't afford to help these people, and anyway they're just lazy bums who don't want to work; never mind that they represent about 10% of the nations workforce and that there are, on average, 5 unemployed for every job. An unemployed teacher or, ahem, accountant, isn't a great match for a job making submarine sandwiches anyway. Most job openings I personally see are for selling insurance, a task I'd be truly abysmal at, or for accepting payments on a home computer on behalf of an overseas company I've never heard of, in return for a commission. It sounds uncomfortably like what's known as a "Nigerian scam." My friend S. talks about trying to find a job online; I shudder to think what she'll come up with, if anything. So, yeah, Republicans and some Democrats think it's a fine idea to reduce the deficit by paying as little as possible to people like me, underemployed for three years this month; my brother, unemployed for over 99 weeks and therefore getting no unemployment at all, and incidentally with significant medical problems; and my friend S., living on Social Security and with physical and mental health disabilities. Her food stamps were recently reduced on an individual basis, and the only explanation given was that it was because her Social Security benefit went up, which it didn't. (I think they used a small, one-time extra SS payment all recipients got earlier this year as an excuse to artificially recalculate everyone's income as higher than it is, so the state doesn't have to pay out as much in food stamps.) I've seldom seen S. buy much more by way of groceries than bottled water, organic milk and cola, and maybe a loaf of french bread. At the end of July she ran out of food stamps and was unable to even buy that much. Her medical coverage is from state-run AHCCCS, which doesn't cover dental or vision or hearing. (S. has teeth missing, with no prospect of dentures or other treatment.) She is consistently treated rather badly by social workers and medical professionals. Most recently, the agency that pays part of her rent started sending $59 less than before, with no explanation, and no returning of phone calls. I as her representative payee have to make up the difference from her same unchanged Social Security check. How am I meant to do that? But no, according to Republicans we can't afford to help people like S., because of the deficit, don't you know (deficit price tag for the extension of unemployment benefits: $33 billion), and because my mentally ill, arthritic friend in the scooter, a fibromyalgia sufferer, is somehow a lazy bum, the undeserving poor. Those same people insist that we must extend the Bush tax cuts for the richest 2% of Americans, which, if made permanent, would add over $1 trillion to the deficit over a 10-year period. Yeah, that'll help. Such trickle-down, voodoo economics have been in place since 2001, and look where we are now. On the extra credit question, I admit that I don't typically read newspapers, except sometimes the online versions. My op-ed pages are mostly two tv shows, Countdown with Keith Olbermann and The Rachel Maddow Show, and sometimes The Huffington Post. I feel a little guilty about not supporting Tucson's sole surviving daily newspaper, but I tended to spend the money without ever reading past page one. Sorry, TNI. Weekend Assignment #330: Baja Arizona Libre! Originally I was going to rant a rant about Congress reducing food stamps and refusing to extend unemployment benefits for millions of Americans, squeezing our poorest people and people made chronically jobless by our faltering economy. But then last night on The Rachel Maddow Show, Rachel mentioned that her executive producer, Bill Wolff, and producer/Maddow Blogger Laura Conaway, would be in Tucson Tuesday evening after a morning spent along the Arizona border near Nogales. Further details were announced on the Maddow Blog: Bill and Laura would be at a meet-up and watch party at the Hotel Congress at 6:30 PM. That was all I needed to know. I'm very fond of The Rachel Maddow Show, an MSNBC show of news and comment. Rachel is one of the smartest people in political broadcasting, someone devoted to factual research and rational thinking. She refutes factually-challenged claims nightly on TRMS, typically with an amused smile and the occasional chuckle. She is friendly and polite, even to people on the political right, who tend to be afraid to appear on her show, lest she disprove everything they say, usually with footage of those same people saying the opposite. She is, in short, a national treasure. Bill Wolff, her executive producer, is the Lorne Michaels of broadcast news, just as funny but younger and cuter. (Sorry, but you are.) I like him a lot from his tv and online appearances, and I wanted his autograph; so I printed out a page of the Maddow Blog on which was printed a car's thermometer reading of 106 degrees. I'm sure lots of people told him today that it gets much hotter than that here, some days. It wasn't all that humid, so 106 today was relatively painless. Anyway, I brought a printout of that downtown to be signed, on the grounds that he couldn't autograph my tv. There were about 150 people at the bar in the historic Hotel Congress, one of my favorite places downtown (the hotel, not the bar). Bill Wolff said he'd been expecting about twelve people, including his dad, who lives on the west side of town. 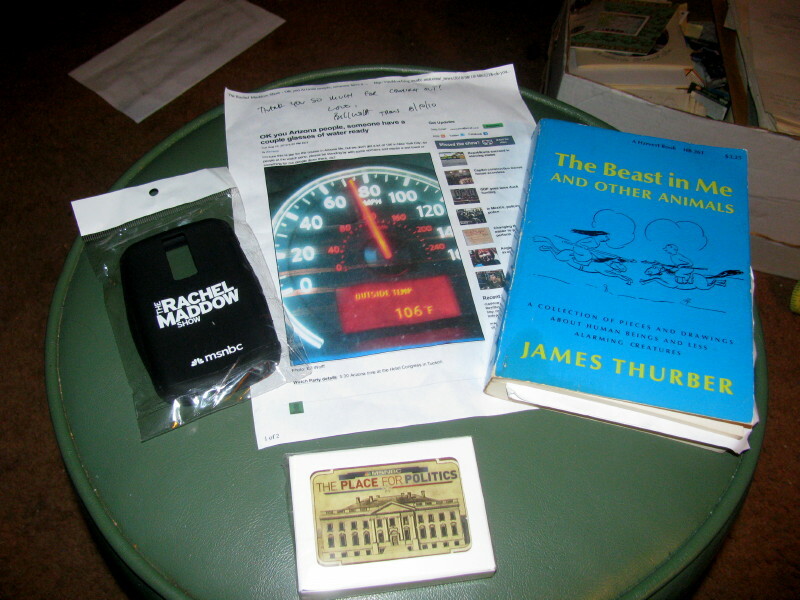 They ran out of The Rachel Maddow Show hats before I got there, but I got a TRMS phone cover and a deck of MSNBC playing cards. 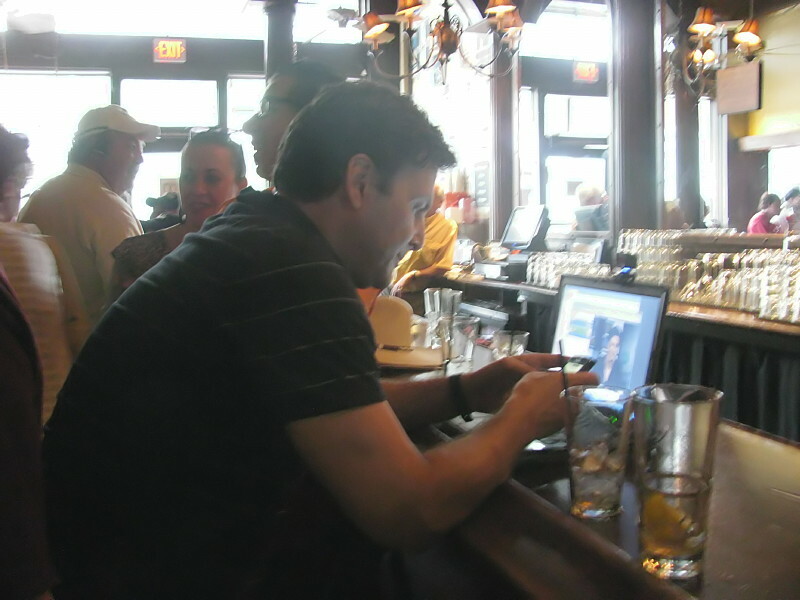 Producing from the bar with BlackBerry and webcam. Shyness and courtesy prevented me from formally approaching Bill Wolff before or during the TRMS broadcast, but I stationed myself just a few feet to his right as he produced the show from his laptop. He had a not-very-good webcam and an earpiece, and the people at the other end of his live feed had a little trouble hearing him over the roar of the crowd. 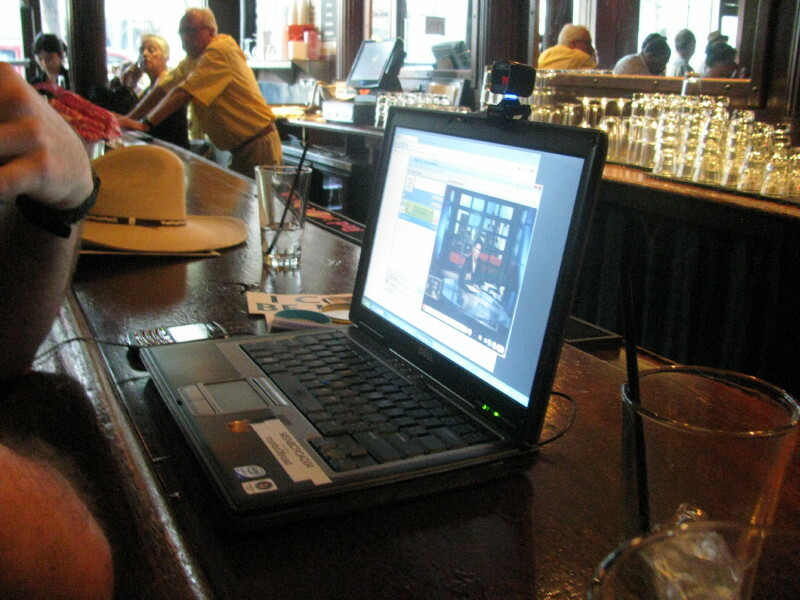 At one point shortly before the Arizona segment, his laptop's battery started to run down, and producer Laura Conaway scrambled to get it plugged in to an outlet behind the bar. The time came for the Arizona segment, which opened with Wolff's interview with Sheriff Tony Estrada of Santa Cruz County, Arizona. Wolff was very impressed with the guy, who had a good sense of what's really going on along the border, and how at odds the reality is with the fear-mongering claims of politicians. The sheriff pointed out that the anti-immigrant fervor mostly comes from people in "the State of Maricopa County" (read: metro Phoenix) in the upper half of the state, several hours from the border. People in Tucson and the rest of Southern Arizona tend to be much more moderate in their views. The sheriff believes that politicians in Maricopa County fan the flames of xenophobia for political gain, and will move on to something else once they're safely reelected. After the broadcast, other fans of the show told Bill Wolff about "Baja Arizona," the humorous concept that Democrat-leaning Southern Arizona would love to secede from the rest of the state, with a cutoff at the Gila River south of Phoenix. He liked that idea. By the way, when I Googled "baja arizona libre" I got a hit from husband John on the first page of results, from a two word comment on the Huffington Post. I told him about it and he laughed. Following is an email I've received, obviously by mistake, from AZ State Sen Russell Pearce to his legal advisor, Kris Koback of the University of Missouri Law School. Looks like they want to amend 1070 so that they can profile people with, say, cars up on blocks or too many people in a rental...in other words, poor people. I didn't quite know what to do with this, but noticing the confidential nature of it, thought I should forward it as widely as possible. God works in mysterious ways. PS I'd already sent this to some of you, but thought that I should explain myself in this additional email. Subject: Fw: One more change! I discussed all of the changes with Mike Hethmon and he concurred. But there is one additional point that he suggested--which you will certainly agree with. When we drop out "lawful contact" and replace it with "a stop, detention, or rest, in the enforcement a violation of any title or section of the Arizona code" we need to add "or any county or municipal ordinance." This will allow police to use violations of property codes (ie, cars on blocks in the yard) or rental codes (too many occupants of a rental accommodation) to initiate queries as well. I have not received anything from the people on the phone this afternoon. Please ensure that they make this addition as well. Thanks! ***This communication is protected by attorney-client privilege. Do not share with others. Then we chatted briefly about St. Michael's, and my parish's collective understanding of the human tragedy stemming from our broken immigration process. I said that most people from St. Michael's care about social justice, and that there's something seriously wrong when a thousand people die in the desert in a single year, just trying to make their way to a better life in a country where they can earn, by their standards, a living wage. Bill Wolff enthusiastically agreed. He said it was the most natural thing in the world for someone in a country with very little by way of money, jobs, or food to want to cross a border into a country where these things can be earned. He said that in all their mostly-"made-up" statistics, supporters of SB 1070 and the repeal of the 14th Amendment to the Constitution (!) neglect to consider that these are human beings. That's very true. They're human beings, and they're suffering. But xenophobic politicians and their followers prefer to demonize these people, to think of them as mostly murderers and drug dealers, people who will break into your home, steal your job and use all the social services so there's nothing left for you. Baloney. People in the country illegally pay sales taxes, in some cases property taxes, and in most cases payroll taxes, and take little or nothing out of the system. An undocumented worker often uses a fake Social Security number. Taxes get paid in, but because it's a fake number, benefits can't be paid out for disability or retirement. Meanwhile they buy food and goods, helping to support the Arizona economy. True, they send money home to Mexico as well, but on balance the effect is a positive one. But don't tell that to the Republicans, the tea partiers and the xenophobes. It doesn't fit what they want to believe, and what they want you to believe. Bill Wolff (who never did get a beer in the two hours I was there) said one more interesting thing, and I told him one more interesting thing. He said that the lack of enforcement along the border is a myth. Wherever they went down there, the Border Patrol turned up within minutes, making their rounds. 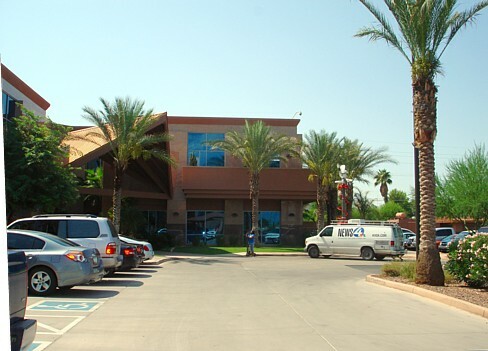 I can tell you that the Border Patrol office in Tucson is a huge complex, just a few miles from me at the corner of Swan and Golf Links. I imagine the Nogales contingent is even larger. My interesting thing was that a group called BorderLinks (I had to look up who it was later this evening) put on an interactive presentation at St. Michael's this past spring. They cast ten or twelve parishioners to role play as would-be legal immigrants, each with a different background and scenario. About half of these fictional immigrants, based on the actual laws and statistics, had a positive result: they were allowed to get a green card and a path to citizenship - eventually. The timetable for this successful attempt at legal immigration tended to be a decade or longer, in some cases much longer, just for permanent residency status. The exceptions were for rich sports stars, and for professionals with Stateside companies actively advocating for them and smoothing the way. Equally deserving applicants, including some of those with family members in the U.S., had no chance at all of immigrating legally. And it's not fair. The other side of this argument is not working from facts, but from fear and bigotry. The average undocumented worker is not a drug dealer or a human smuggler, although such people do exist. Harassing people in a state that's one third Hispanic, on the suspicion of being in this country illegally, does not help law enforcement go after the actual criminals; it merely ties up resources in a state that's not exactly flush with money right now. Undocumented workers tend to take jobs that "Anglos" don't want, for less money than other workers demand. They are the day laborers, the crop pickers, the seasonal construction workers. Enforce the laws against hiring them, and Arizona businesses may be forced to pay more money to hire people who are here legally. If that is done, people who come here specifically to get work will be less likely to make the dangerous crossing for jobs that aren't there. Already, law enforcement statistics show that fewer people are coming in, because the recession has made all jobs more scarce. But that doesn't matter, because "They" are brown and scary and evil, and taking over. Aren't they? More photos from the meetup can be found on my Flickr set.